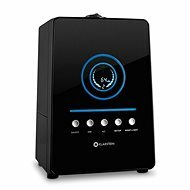 The TOPCOM Multifunctional Humidifier 1850 is an ultrasonic humidifier with a built-in ionizer that maintains a relative humidity range within 40-80 percent, and reduces the presence of pollen and bacteria. It also features cold and hot steam, as well as adjustable humidity levels. The volume of the tank is 6 litres. It continuously works up to 18 hours and it effectively handles rooms with areas of 35 square metres. Along with the TOPCOM 1850 humidifier, you'll also receive a remote control. The appliance works well in conjunction with the attached timer. For shipping to other EU countries visit this page Topcom Multifunctional Humidifier 1850. Für Versand nach Deutschland, besuchen Sie bitte Topcom Multifunktionaler Luftbefeuchter 1850. Chcete doručit zboží do Česka? 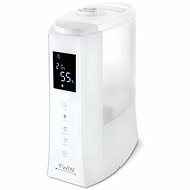 Prohlédněte si Topcom Multifunctional Humidifier 1850. Chcete doručiť tovar na Slovensko? Prezrite si Topcom Multifunctional Humidifier 1850. Für Versand nach Österreich, besuchen Sie bitte Topcom Multifunktionaler Luftbefeuchter 1850. Magyarországra történő kiszállításért tekintse meg ezt a termékoldalt: Topcom Multifunctional Humidifier 1850.